It's that time of year again! Time to review the state of the Northern League the competition scene in the North of England. As already mentioned, the main reason for the decline in attendance is the steady fall in the numbers playing FOG AM. The 2014 the average attendance was down 58.9% compared to the peak of 2011. The actual figure is worse as a couple of doubles teams often played as singles. It's not all bad news as DBMM continues to see a slow but steady increase in popularity. In 2014 average attendance was up 11.6% on 2011. The numbers playing FOG R are essentially stable with 3 teams playing in every road compared to 4 and 5 in FOG AM & DBMM respectively. The decline in those playing FOG AM v2.0 seems to reflect a more general trend if comments on the internet are anything to go by. The botched launch of v2.0 by Slitherine and the lack of support from the rules authors are the most quoted reasons behind the decline. It's not that there's a lack of interest in the ancient & medieval period. It's just that, so far, nothing has emerged to tempt those who've abandoned FOG AM for the likes of FOG R and FOW. I've seen repeated comments along the lines of "I've got loads of ancient / medieval armies simply gathering dust". Perhaps Sword & Spear, Art de la Guerre, or DBA 3.0 will tempt people back to the table? Who knows. Unfortunately, tempting players back to the table is only the first part of the process. To be viable there has to be enough players willing to "seed" the competition circuit and draw in others. 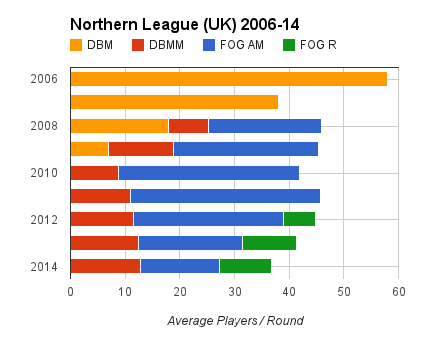 FOG R managed this in 2012/13 but so far none of the new ancient and medieval rules seem able to do this. 2015 looks like it's going to be another year of transition. As the Chinese curse says "may you live in interesting times". If FOG is in decline then it's replacement will likely be another bland competition set so tournament players will be able to spend hours designing a new super army with which they can play unhistorical opponents. In my neck of the woods DBA 3.0 has created much interest, but not from these players. Rather from a more casual player group wanting an enjoyable game without all the silliness of some rules and the intensity so loved of people wanting complex competition games. THe blanket culling of DBM from the circuits didnt help. The SW Doubles Leagu is still thriving numbers wise and DBM still has a core of players happy to play it at many clubs and theres at least 8 tournaments currently offering it. At last checking there were 60 entrants across the whole DBM year but this is far fewer than the player base as theres at least another 7 at my own club who play DBM but will not enter tournaments as they cannot play at the required speed and standard to enjoy it. Hi Drew. I suppose there's a difference between "being in decline" and "complete absence". Applies to all rule sets in the end. I can remember when 7th was enjoyable, until it was wrung to death in competitions. Any rule set subject to a tournament environment will wane, when people have figured out how to abuse it to the nth degree. "Cheesey" plays do pall after a while but with FOG AM it's more about issues with the rules that crop up game after game. With FOG R there's less of this but it still happens.